Did the storyteller do us justice? 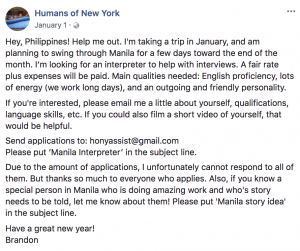 At the beginning of the year (quite literally) Humans of New York founder, Brandon Stanton, announced that he would be visiting the Manila later in the month, much to the excitement of many, but also to the dismay of others; many netizens began debating whether the overpopulated and polluted capital would be the best representative of the country as a whole. Humans of New York’s Facebook post earlier this year. For those of you who aren’t one of the 18 million who follow Stanton’s work on Facebook, he is the person behind the popular photo series Humans of New York (HONY), a storytelling project turned photo blog (turned book) that features portraits of New Yorkers accompanied by insightful, sometimes funny, sometimes tragic stories. Since its humble beginnings in 2010, HONY has amassed a pretty large Filipino fan base. Apart from holding a talk at the University of the Philippines, Stanton’s spent his week-long trip to Manila doing what he does best: exploring the city and interacting with its inhabitants. Armed with a camera and an interpreter, Stanton traveled around the Metro collecting stories from a variety of people. His photos have finally been posted on his website and various social media platforms, and they are nothing short of touching. In an interview, Stanton expresses his surprise over how similar the stories of Filipinos are to those of others from around the world. It just goes to show that no matter what country, culture, or background you’re from, the human experience, in its simplest, is shared. What do you think of Brandon’s photos of Manila? To view more of his photos, check out the Humans of New York website or Facebook page. Main image from Humans of New York.